Kazuma's younger brother. He looks up to his Ayano Nee-sama and practically idolises his Kazuma Nii-sama, stating that one day he hopes to be as strong as him so he can protect everyone. Ren has the appearance of a bishōnen, which sometimes earns him the contempt of some of his male classmates. Even so, Ren appears to be very popular at his school, excelling in his studies and in his athletic abilities. His biggest admirers include Suzuhara Kannon and Serizawa Tatsuya. Ren later falls in love with a girl named Ayumi, only to find out that she is just a clone created to be sacrificed at a ritual. Even after saving her from the ritual, she still dies due to having a short life span, but not before she can tell him that she also loves him. Despite Ren's feelings of inadequacy early on in the series, Ayumi's death inspires Ren to become stronger so he can protect the ones he loves. Ren's power is the Golden Flame, said to have the largest purification effect. 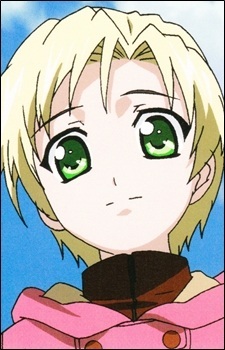 (source : wikipedia) Ren has never liked the fact that his brother Kazuma was cast out of the family simply for having no power. He always hopes that one day, his brother Kazuma and his father will get along someday so that the three of them can be a family again.